Welcome to my little guide on Ymir. It's a post 21.12.12 patch build, so the item descriptions here and in smite are different. If you have any suggestions, please leave a comment with some constructive critique ^^. I will update the guide as soon as i test the build more, or remember something i forgot. so you will loose hp before the ult goes off. - LAST ITEM this can be anything from the finishing items above , depending on the situation. If you pick up an item with no FOCUS be sure to get some in the STATS window asap. Makes your stuns and slows more powerfull. Great early game. After you stun your enemy or hit him with your 2, just punch him in the face. HARD. If possible place a wall to stop him escaping. With a good partner mostly results in a first blood.Get's less usefull late game. Wall Lifetime: 3 / 4 / 5 / 6 / 7 s.
Ymir smashes his club, doing 90 / 160 / 230 / 300 / 370 (+60% of your magical power) magical damage to all enemies in front of him, slowing them by 50% for 4 seconds. Applies Frostbite. Your main damage dealer. Use after stun, additionally you can punch your opponent in the face some times, until Frostbit wears off. MACE TO THE FACE. Ymir uses his breath to freeze enemies in blocks of ice, doing 50 / 90 / 130 / 170 / 210 (+50% of your magical power) magic damage and stunning them for the duration. Applies Frostbite. Duration: 1.5 / 1.75 / 2 / 2.25 / 2.5 s.
Your best ability. Try to stun as many enemies as possible and follow with spikes or ult. Ymir begins to freeze the air around him, causing shards of ice to grow on his back. After a 3 second slowing channel, Ymir erupts out of his frozen state, causing shards of ice to do 600 / 750 / 900 / 1050 / 1200 (+200% of your magical power) magical damage to all enemies in his range. Applies Frostbite. Cooldown: 90 / 85 / 80 / 75 / 70 s.
Ymir works best with an AD or AP carry which has a stun, like loki, anubis, anhur, or even arachne, or a good pusher (ra, Anubis, hel). In team fights try to initiate by cutting off one enemy with your wall and then stunning him. If Arachne jumps on one of your allies, stun her of him. -While escaping try to put your wall directly under you, as , cause of the delay, it will appear behind you, cutting off your pursuers. DOES NOT WORK WHEN YOU'RE SLOWED. -Try to start team fights in the jungle, where your walls and ult are most effective. I used this build for a few matches in arena and I am very satisfied, however I do not have much luck when playing conquest but that could be because of teammates not paying attention. But otherwise this is a good build. That was my match in arena, 11-0-21. Sadly xbalanque left though which made it easier. 5350 Ryashon I used this build for a few matches in arena and I am very satisfied, however I do not have much luck when playing conquest but that could be because of teammates not paying attention. But otherwise this is a good build. 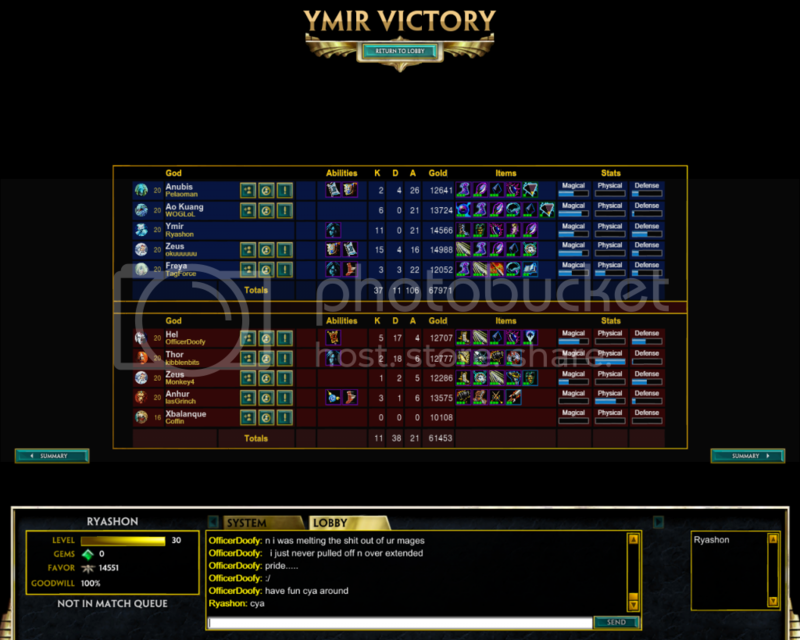 [img]http://i141.photobucket.com/albums/r48/Bookskill/System/Smite2013-01-0221-32-28-145_zps342862d0.png[/img] That was my match in arena, 11-0-21. Sadly xbalanque left though which made it easier.